Whereas most of the EU press has been warning for days of a possible ‘false flag’ by the Russian and Syrian forces in the province of Idlib (aka, the media assumed that the Assad regime would carry out a chemical strike and blame it on rebels), US President Donald Trump shifted world attention back to the troubled region with just one tweet. Earlier this year, the US, in close cooperation with France and the UK, struck the regime of Syrian President Bashar Al-Assad when they stood accused of having bombed rebels with chemical weapons. 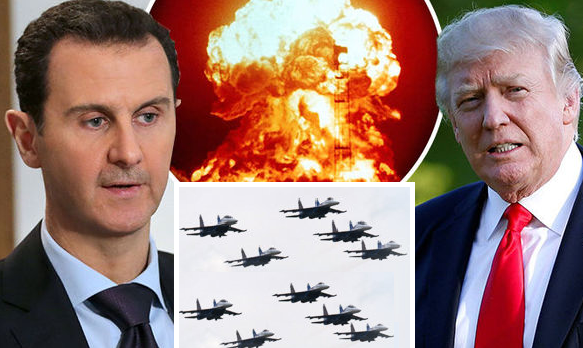 Related coverage: <a href="https://thegoldwater.com/news/25735-Syrian-President-Assad-The-Agenda-Of-The-Deep-State-In-The-US-Is-To-Create-A-Conflict-Video "> Syrian President Assad: “The Agenda Of The Deep State In The US Is To Create A Conflict” (Video)</a>. This time though, the Russian navy has been building up forces and the local press warned that if the US would strike against Assad’s soldiers again, there would be immediate retaliation against any NATO planes or military bases in the area. US ambassador to the UN Ms Nikki Haley also chimed in, tweeting: "All eyes on the actions of Assad, Russia, and Iran in Idlib. #NoChemicalWeapons"
With rebels being defeated in the most of Syria, the offensive in the northern province could prove to be the last major battle of the Syrian civil war. The UN estimates that there are about 30,000 al-Nusra and al-Qaeda jihadist fighters still holding out in Idlib. Syrian President Bashar al-Assad, together with his Russian counterpart Putin, is said to be preparing a phased offensive. Russian Foreign Minister Sergei Lavrov has claimed that action against the "terrorists" in Idlib would be justified, accusing them of using civilians as human shields. What better way to play down a future U.N. Illegal Act than to announce in advance that there is plan to "stage" a false flag event to make ones self look bad. Then use the FAKE warning to cover the event that you planned weeks ago that leaked out. Russia & Syria outed the UN's last phony gas attack but Trump bombed anyway to get the fake news off his back. The same thing will happen again but Russia is determined to not let it go unchallenged. NATO is The Devil. "aka, the media assumed that the Assad regime would carry out a chemical strike and blame it on rebels"
Why the hell would they do that? What do they have to gain? The US and their IS forces would gain a pretext to send more missiles if they staged it, what would Assad gain? The brutality and disdain of human life shown by the Saudi and western terrorists is already well documented. If anyone is going to falseflag it's the CIA backed headchoppers.